This morning began absolutely glorious! We slept solid through the night without any sleeping aids, only good ole’ fashioned sleep deprivation. The clean mountain air was crisp and cool and the sun was bright. I felt like a brand new human! John was already up and motivated and out the door walking the streets of the village in hunt of some bougatsta. What is bougatsta? you ask. It is the breakfast of champions! ….well actually it is the breakfast of chubby Greeks. My favorite! It is a light buttery pastry filled with warm custard creme, sprinkled with powdered sugar and cinnamon. John was waiting 8 years now to eat one. He arrived at the apartment with 5 bougatstas and 2 coffees. My hero! As we ate, the kids all made various approving eating sounds like, mmmnnnn, awwwwww, ohhhhhh! john told us about his trip to the pastry shop. He said he was trying to tell the bougatsta lady that he hadn’t eaten bougatsta in 8 years and it was his favorite. As he tried to speak Greek to her, he actually said, “8 year old bougatsta, NO! I love you! bougatsta!” He said the lady just looked at him weird trying to figure him out. Did he really love her, ? The next 4 hours was a van ride to Pelio, with many windy roads through mountains so the kids could not play on their ipads or they would get sick. So that left them with nothing to do except irritate adults. We played musical chairs constantly switching around who sat next to who, and who took turns sitting in front with us. Dino kept getting himself into trouble and sat most of the time right behind me. Finally the seating arrangement that worked with the least amount of arguments and irritations was Dalia sat in front, Dimitra and Dafni sat in the middle section of the van and Dino sat in the back section. We had peace and quiet until Dimitra (13 years old) who was sitting in Dino’s seat right behind me, decided to become 4 years old again and tickle and poke Dafni, while Dafni yelled and squealed STOP! So Dino had the funniest line of the day, “I think that seat behind mama has a spirit of childness in it” So now we tell Dino to stop acting ‘childness’ he caught from the chair. We had a great afternoon at the beach and we LOVE our little apartment here in Pelio with great wifi. Dalia’s afternoon did not shape up to be too good for her, though. She stepped on a bee and squished it between her last two toes. She was very brave though and barely cried and went right back to exploring the beach, this time wearing her flip-flops. For dinner we ate at the restaurant right here near the apartment. The chef special was spaghetti Bolognese. So we ordered that and also calamari, greek salad, and french fries. 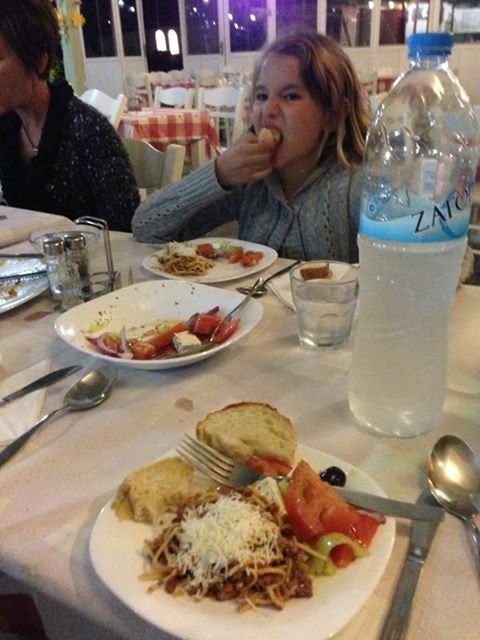 The spaghetti was heavenly and every Milan was having food ecstasy except Dalia. When we popped a giant piece of fried calamari freshly caught in the very sea we sat by, never frozen, we all were going to new levels of heavenly food realms. John especially sat in a stiffened state, frozen in time, both hands firmly planted on the table, eyes closed, head tipped back. I said, “are you ok?”…….silence…..more silence, me and all the kids looking around at each trying to see if anyone knew what happened to John, finally he speaks! “I waited 8 years to experience this, I might cry”. John loves his calamaries and has become a connoisseur trying them in every American restaurant chasing that elusive taste he has only found in this small mediterranean country. It is really simple though. Fresh, wild calamari caught daily in the sea only feet from the the restaurant that serves them. Truly only something one can find here in this beautiful country. But clearly Dalia was not experiencing any of this delight while eating her food. She sat glum and sullen pushing her Bolognese around around on her fork, making faces at her calamari. We asked her what was wrong, she said, “my spaghetti smells like diarrhea and when I tasted the calamari’s skin it tasted like rubbery”. Poor Dalia experienced every Milan in unison protesting her remarks and telling her their own version of what they thought the food tasted like, to which she just said, “I can’t eat diarrhea!” So the moral of the story is this: Delicious bougatsta and 4 hours of road food junk has a toll to pay; “sudden onset of ‘childness’, causing fresh healthy food tasting like diarrhea”. BEWARE!